The new support library in Android L introduced two new UI widgets: RecyclerView and CardView. The RecyclerView is a more advanced and more flexible version of the ListView. 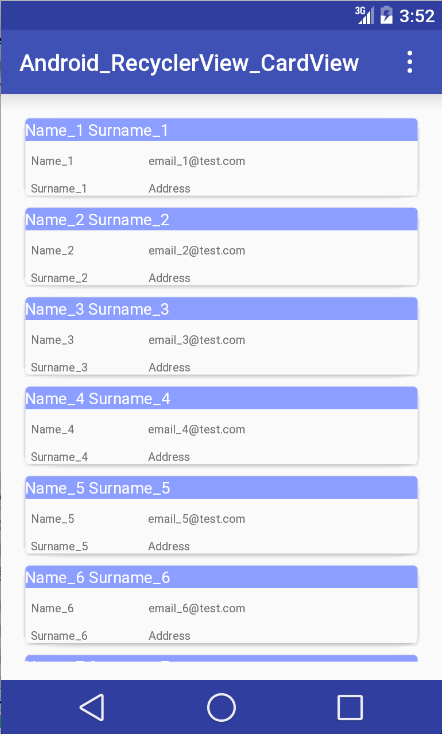 This new component is a big step because the ListView is one of the most used UI widgets. The CardView widget, on the other hand, is a new component that does not “upgrade” an existing component. In this tutorial, I’ll explain how to use these two widgets and show how we can mix them. Let’s start by diving into the RecyclerView. We now have to override two methods so that we can implement our logic: onCreateViewHolderis called whenever a new instance of our ViewHolder class is created, and onBindViewHolder is called when the SO binds the view with the data — or, in other words, the data is shown in the UI. In our implementation, we override onBindViewHolder where we bind the data (our contact info) to the Views. Notice that we don’t look up UI components but simply use the references stored in our ContactViewHolder. In onCreateViewHolder we return our ContactViewHolder inflating the row layout (the CardView in our case).